IF YOU missed this quiz in the January edition of Rugby World, here’s your chance to test your knowledge of the game now – it’s based on the World Cup and other events in 2015. The quiz is out of 100, with a point for each correct answer unless otherwise stated, and it’s no piece of cake! 1. Which team received the most yellow cards (six) at RWC 2015? 3. Which TV personality did David Pocock invite to the World Cup final? 4. What did thousands of viewers petition ITV to do? 6. Which Argentina player did Matt Giteau call a “beautiful man”? 7. Samoa scrum-half Kahn Fotuali’i called a 35-year-old from Crawley an “idiot”. Why? 8. Jack Nowell, Bryan Habana, JP Pietersen and Nehe Milner-Skudder – who’s the odd one out? 9. What did Matt Dawson do that upset New Zealanders? Can you identify the ten players pictured at last autumn’s World Cup? Score two points for each you get right. 2. Which stalwart won the Premiership’s Golden Boot for the fourth time? 3. 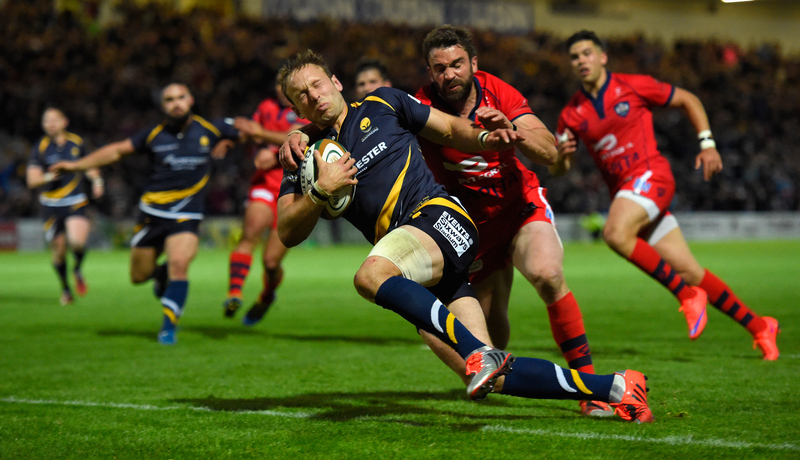 Against which team did London Welsh bag their only point of the 2014-15 Premiership campaign? 4. Who became only the fifth away team to win a Super Rugby final? 6. Whose late try, converted by Ryan Lamb, broke Bristol hearts in the Greene King IPA Championship final? Match the quote from last year’s World Cup with the speaker. Two points for each correct answer. 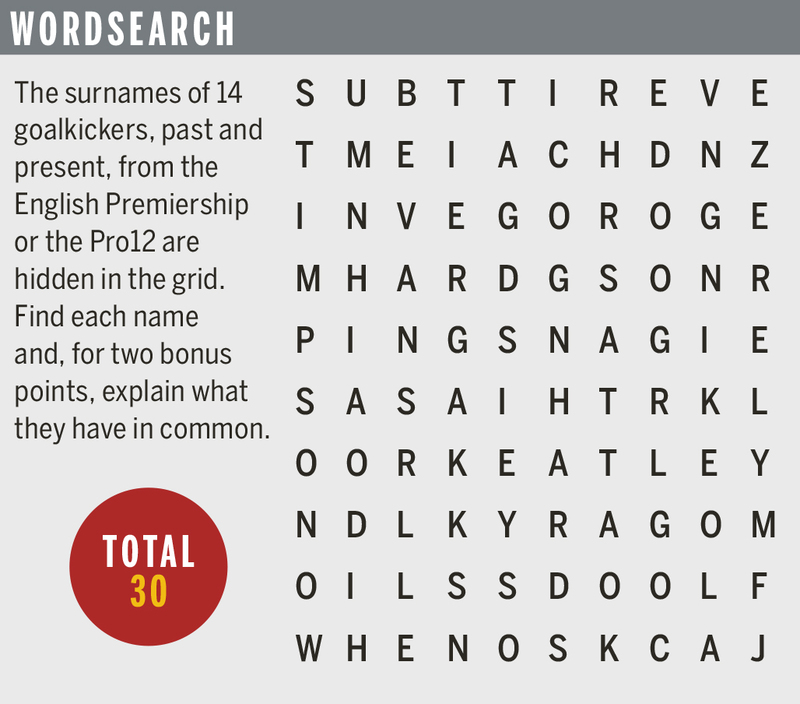 The surnames of 14 goalkickers, past and present, from the Premiership or Pro12 are hidden in the grid. Score two points for each name you find and for two bonus points, explain what they have in common. 1. Who took only five minutes to score the first try of last year’s Six Nations? 2. Which Six Nations fixture featured 90 errors and 28 penalties? 3. Which Irishman, with more than 26% of the public vote, was named Player of the Tournament? 4. George North grabbed Wales’ first championship hat-trick since which Lion scored three tries against England in 1969? 5. The points tally of 660 was a Six Nations record – true or false? 6. Which is the only country to have won all three Six Nations titles – men, women and U20 – in the same year with a Grand Slam? 7. Who came off the bench to win the 2015 Rugby Championship for Australia – but was omitted from the RWC squad? 8. How did Liam Messam breach the rules during the New Zealand v Australia game on 15 August, earning the Kiwis a fine? 9. Who scored a 19-minute hat-trick as Argentina beat South Africa for the first time? 10. Who finished runners-up in the HSBC Sevens World Series for a record sixth time?